Backblaze provides unlimited online storage and a Mac OS X- or Windows-native backup client for $5. At that price, says Backblaze co-founder and CEO Gleb Budman, many have begun to wonder how the company can afford to stay in business. That’s when Backblaze decided that a DIY solution was the right way to go, and they’ve published the spec as a blog posting on their Web site. 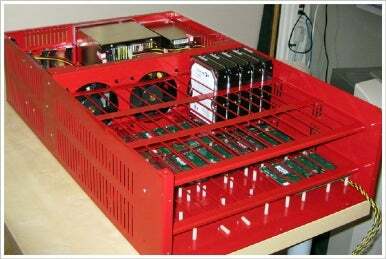 The “Backblaze Storage Pod” system comprises a custom container that occupies 4U in a standard equipment rack. Inside are 45 hard disk drives, four Serial ATA (SATA) controller cards, an Intel motherboard and processor, 4GB RAM and two power supplies. Each box runs Debian 4 Linux operating in 64-bit mode and the JFS File System, a freeware journaling file system. Though the 4U rack chassis is custom, the Backblaze Storage Pod is just commodity storage components inside. The 67TB Backblaze Storage Pods are individually accessed using the HTTPS protocol through Apache Tomcat 5.5, an open source implementation of the Java Servlet and JavaServer Pages. Obviously, Backblaze isn’t giving away its secret sauce—the company has created customized server software that drives all this technology, de-duplicating and segments data, encrypts and transfers it, and packages the data for recovery later. But according to Budman, the specification Backblaze has released enables anyone to create a 67TB storage system they can use for their own purposes.